I'd recommend reading anything that helps develop your ability to understand and solve a problem. Triaging issues by importance and properly identifying their causes is critical in almost every aspect of business. Without that, you can easily spend a lot of time on the wrong problem, or an ineffective solution, and your time is, more or less, your most valuable commodity. So I'd suggest books like A Certain Ambiguity by Gaurav Suri and Hartosh Singh Bal, or Freakonomics by Stephen Levitt‎ and Stephen Dubner - books which will explore different ways of delving into problems and understanding their impact. Question: What books would you recommend to young people interested in your career path? Reading 'Freakonomics' by Steven Levitt & Stephen J. Dubner, changed my perspective of the whole world. Such a well-researched piece of writing. Complete eye-opener how lots of successful people made it because they were at the right place at the right time, and not just an unidentifiable X factor. If you are looking for conversation starters ever, lots of them in this book. I believe reading is a habit that must be inculcated irrespective of the career paths. Below mentioned are a few of my favourites that can hopefully bring wisdom to aspiring entrepreneurs. I would say my favorite book is Freakonomics. I like it for two reasons. First, this book is full of interesting facts, and that makes it exciting. Second, the whole book is a paradigm shift. After you read, you’ll look at the world around you differently. I guess that one goes as non-business. I don’t need to say much here. This book invented an entire genre. Economics was never supposed to be this entertaining. Which is more dangerous, a gun or a swimming pool? What do schoolteachers and sumo wrestlers have in common? Why do drug dealers still live with their moms? How much do parents really matter? How did the legalization of abortion affect the rate of violent crime? These may not sound like typical questions for an economist to ask. But Steven D. Levitt is not a typical economist. He is a much-heralded scholar who studies the riddles of everyday life—from cheating and crime to sports and child-rearing—and whose conclusions turn conventional wisdom on its head. Freakonomics is a groundbreaking collaboration between Levitt and Stephen J. Dubner, an award-winning author and journalist. They usually begin with a mountain of data and a simple question. Some of these questions concern life-and-death issues; others have an admittedly freakish quality. Thus the new field of study contained in this book: Freakonomics. Through forceful storytelling and wry insight, Levitt and Dubner show that economics is, at root, the study of incentives—how people get what they want, or need, especially when other people want or need the same thing. In Freakonomics, they explore the hidden side of . . . well, everything. The inner workings of a crack gang. The truth about real-estate agents. The myths of campaign finance. The telltale marks of a cheating schoolteacher. The secrets of the Ku Klux Klan. What unites all these stories is a belief that the modern world, despite a great deal of complexity and downright deceit, is not impenetrable, is not unknowable, and—if the right questions are asked—is even more intriguing than we think. All it takes is a new way of looking. 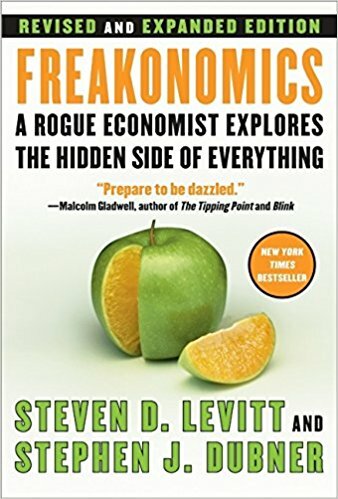 Freakonomics establishes this unconventional premise: If morality represents how we would like the world to work, then economics represents how it actually does work. It is true that readers of this book will be armed with enough riddles and stories to last a thousand cocktail parties. But Freakonomics can provide more than that. It will literally redefine the way we view the modern world.